Understanding and improving how your website works for you is a critical component of your marketing strategy. If set up properly, your website can be a strong source of new customer leads. Even client referrals are going to visit your website to learn more. 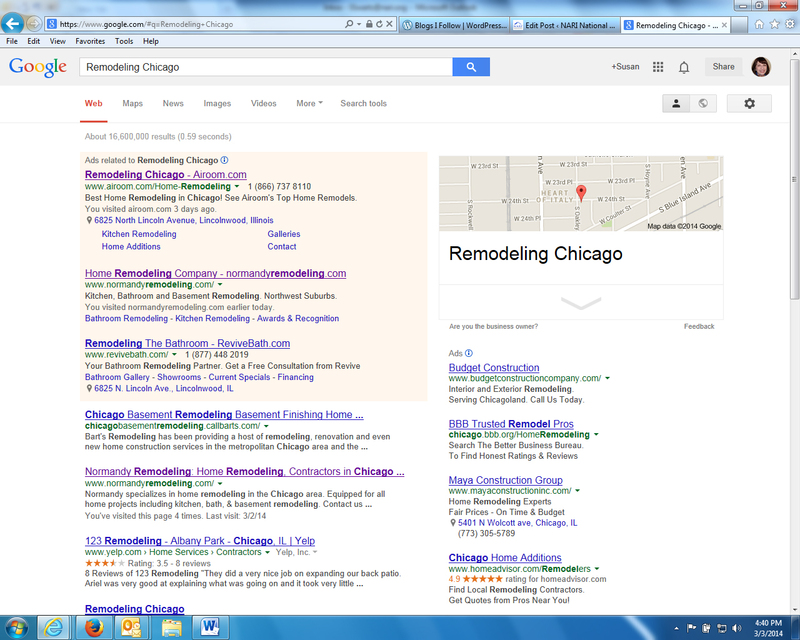 Google search for Remodeling Chicago pulls Normandy Remodeling close to top of results. While having a good website is important, it’s not enough if search engines cannot find you to display your site. There are a number of things you can do to increase your site’s visibility. How does a search work? There are more than 60 trillion individual websites on the Internet. Search engines, like Google, Bing, etc., navigate the Web by crawling—following links from page to page. Pages are sorted by content and tracked in an index. Search engines write programs to deliver the best results possible and use algorithms—or clues—to understand what the user means. Based on these clues, relevant sites are pulled from the index, and the results are ranked using more than 200 factors. Results are displayed in a matter of seconds. Research keywords: Customers that know you can search and find your business by name. Prospective clients are more likely to search by what they need, i.e. “kitchen remodeler .” You can do keyword research by using Google’s Keyword Tool, Keyword Spy and other free sites to find and increase these words on your site. Or you may want to hire a Web designer to help you. Increase your pages: Sites with five or more pages tend to rank higher in search engine results. Depending on the number of clicks they get, these extra pages can show up inn a Google search under your business name to the various areas of your website. This helps a searcher in two ways: they can get a better understanding of the site’s content before they visit, and they can take a shortcut to the specific page that interests them—like award-winning home additions—rather than having to navigate from your site’s home page to find the information they want. A good way to increase your site’s visibility is to increase the number of pages on your site, adding pages such as About Us, Contact Us, Services We Offer or Photo Galleries. Design Group Three’s About Us page provides decriptive information that helps search engines grab content when performing a search. Describe your images and videos: Name the images on your site with descriptive words so that search engines know that they are relevant. For example, the image should be named kitchen remodel.jpg rather than image 123.jpg. Better yet, use the name of the town or neighborhood and the type of project it was in your naming convention. This is often overlooked by many site owners who regularly post images and videos to their sites. Submit a site map: Create and submit a site map file—a listing of all the pages on your website—to search engine site’s using their Webmaster Tools. If you are using a content management system, you can install a plugin that will automatically generate the file for you. Get listed in established directories: Take advantage of free listings like Yelp, but also consider paid ones because they often carry the most weight at the search engines. If a $299/year listing on Yahoo brings in $1,000 extra in business, it can be a good return on investment. Create and connect to your blog: A blog also helps raise your ratings with search engines. 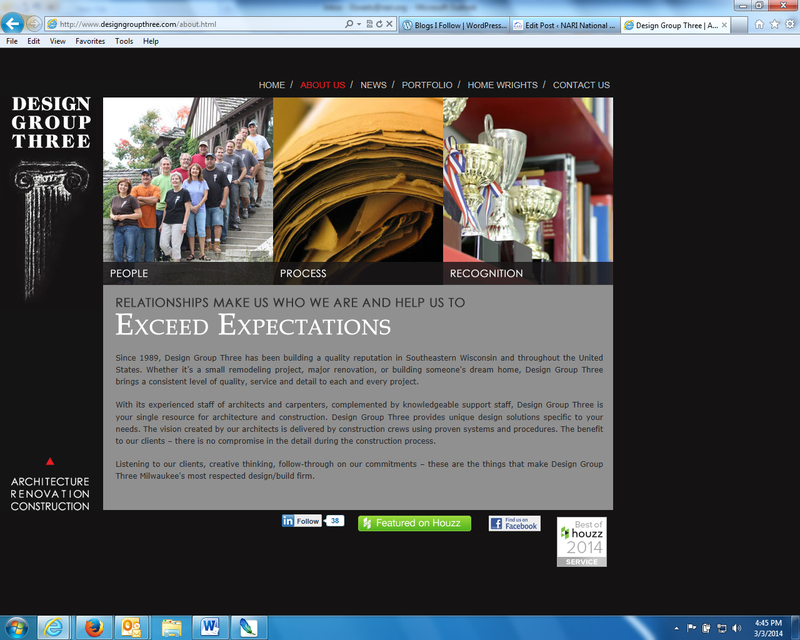 An organization’s blog is an effective way to share latest news and online engagement. Make sure your blog is part of your company’s domain and not hosted on a separate URL. Use the media: Press releases are an easy way to generate a large number of back links to your website. Press releases help encourage reporters to write a story about your company or use you as an expert. Digital media outlets often will embed a hyperlink to your site. Post the article on your site and ask visitors to “like” the article which will help it—and your business name—rise to the top of a search engine. Use social media: Social media can be very useful raising small-business visibility because your social media pages are indexed by search engines, and searches for your company name will turn up results for all of these sites. Use Houzz: Houzz is now considered the leading platform for home remodeling and design, having surpassed 2 million design and remodeling images available on its platform. Like many remodelers and design companies, NARI member Matt Krier, GCP, of Design Group Three in Glendale, Wis., is finding Houzz a valuable marketing tool and estimates that he receives more leads from his Houzz account than his other efforts. “People call and say, ‘I saw a photo of work you did, and it’s just what I’m looking for,’” Krier says. He now takes photos of every project he completes and loads it on his account. Need help with understanding social media? Download these NARI’s marketing tools to social media. « How do you Houzz?